Many consider Saint Francis Xavier among the greatest of Catholic missionaries. Francis Xavier was born in 1506 in northern Spain to a noble and pious family. He left home at age 19 for the University of Paris, where he studied Theology and earned his Master of Arts in Philosophy. He continued as a professor in philosophy for four years, the beginning of what appeared to be a promising academic career. However, God had other plans. While Francis was at school, he met a fellow student who would become a great influence in his life. His name was Ignatius of Loyola. Earlier, Ignatius had a religious conversion and devoted the rest of his life in helping others grow closer to God, and that included Francis. The two became great friends, and eventually, Francis made the Spiritual Exercises under Ignatius’ direction. The Spiritual Exercises are a series of meditations designed by Ignatius in which one meditates on the core aspects of the Catholic Faith – such as sin and forgiveness, calling and ministry – and contemplates the life, death, and resurrection of Jesus. In 1537, Francis and Ignatius were ordained priests. The following year they and five others went to Rome to seek the pope’s blessing to form the Society of Jesus, also known as the Jesuits. Pope Paul III approved the plan for the Society in 1540. So, when he was asked to go to India in 1541 to spread the Faith, Francis was overjoyed. His travels started in Portugal. From there Francis traveled to Kenya, Africa, then to Socotra (an island off the coast of Somalia), and finally to Goa, India. He lived a life of piety and everywhere he went Francis ministered to the sick and poor and spread the Good News through his words and example. He aided missions that had fallen into neglect by teaching, baptizing, and confirming those in the Faith and continued to check up on them throughout the years. In his travels, he was approached by a Japanese man named Anjiro. He had fled Japan after being falsely accused of murder. It was because of Anjiro that Francis turned his attention toward Japan. In 1549, Francis, with a newly-baptized Anjiro, landed in the Japanese port, Kagoshima. Francis quickly realized that he would need to adapt his way of evangelizing for the Japanese. Unlike those in Europe and India, his poverty repelled those in feudal Japan. There was also a major language barrier since the language was unlike any he had heard before. Although Francis was welcomed by the local daimyo, that is, a nobleman, he was not allowed to convert anyone to Christianity. This was not a discouragement to Francis and he continued to preach and spread the Word of God. Despite his best efforts however, many Japanese kept to their Buddhist or Shinto beliefs. They had trouble grasping and accepting some of the Church’s teachings. Many of the nobles grew hostile at Francis’ preaching his Faith and the few communities Francis did establish were forced to go underground due to the amount of persecution they faced. After a few years, Francis sailed to China in the hopes of evangelizing there as well. Unfortunately, he was denied entry to the mainland. He died a few months later of an acute illness at age 46 on an island off of Canton He is buried in Goa, India. Francis Xavier was canonized a saint by Pope Gregory XV in 1622, along with his friend and mentor, Ignatius Loyola. Francis is the patron saint of missionaries, sailors, Japan, and the East Indies. His feast day is on December 3rd. Download the free printable monthly saint page using the button below. 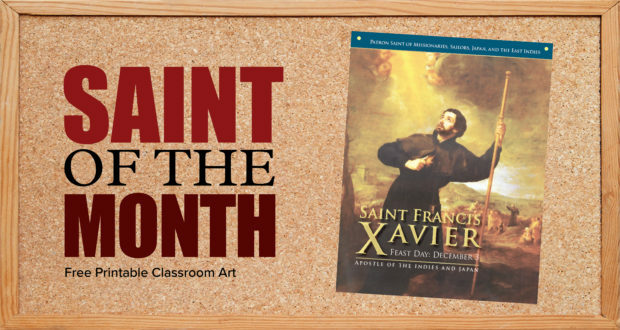 You can pin it to your classroom wall or place it on your refrigerator to help your children learn more about Saint Francis Xavier.